I can't believe it's October. Where did September go? It has just flown by, the end of term and school holidays , it has been relaxing and enjoyable, just what I needed. Also I have been at the ASG for the last couple of days and did a fabulous workshop on a basic shirt. I learnt so much and I will blog about this when I have finished the shirt. 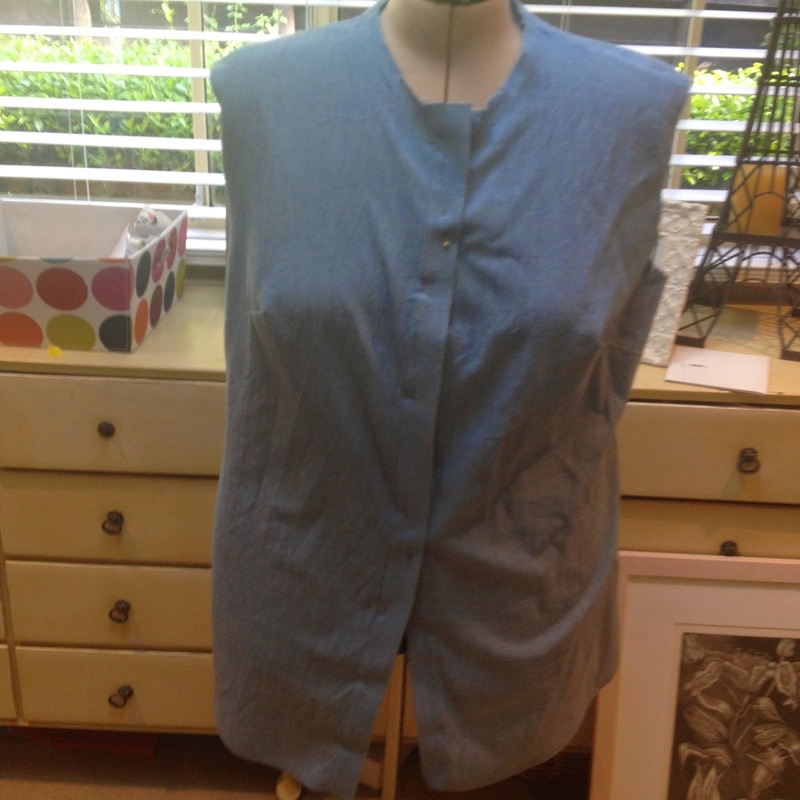 Back to my August make which was going to be a chambray shirt with McCall's 6436. I made the size 22 with a DD front. I didn't really look at the hips because I thought they would be fine but when I tried the shirt on it was too tight across my hips. My vision for this shirt was a loose jacket type shirt. 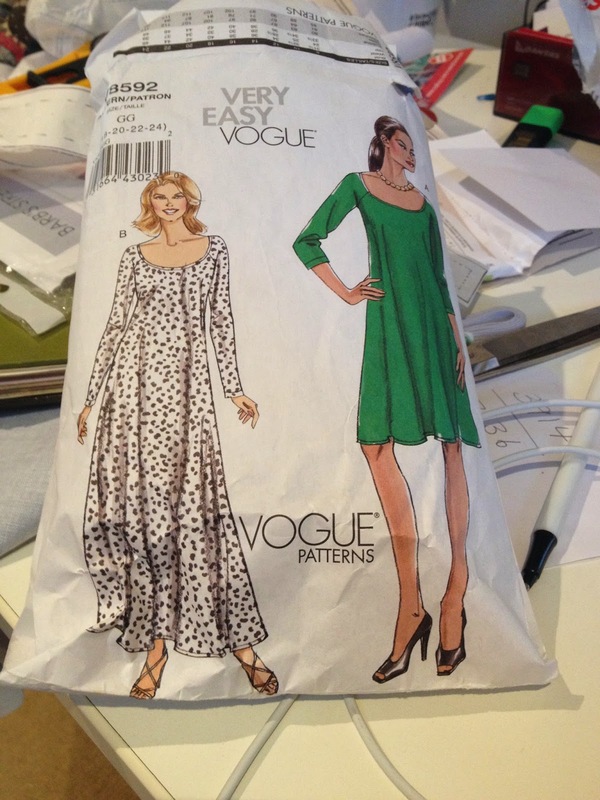 So sewing stalled, confidence gone and doubt and disappointment appeared. What to do? I'm still deliberating. The shirt is actually a little too large across the bust, so next time I would go down a size there and then increase the hips or try to decrease my hips, a much harder option than adding a bit of fabric to the sides. Not a great photo sorry. The shirt is quite tight in the hip area but the bust is great. One thought was to cut off the top part and leave that, then add an insert into the lower part front and back so it becomes more of an A line or add gathers into the bottom section. I do have some fabric left over but not enough to make a whole new back and front. Either of those options would work unless someone else has a fabulous idea. I haven't had much success lately so I need to have a hard think about what to do next. My shirt from my workshop I think will be better. Well I have had a disaster. 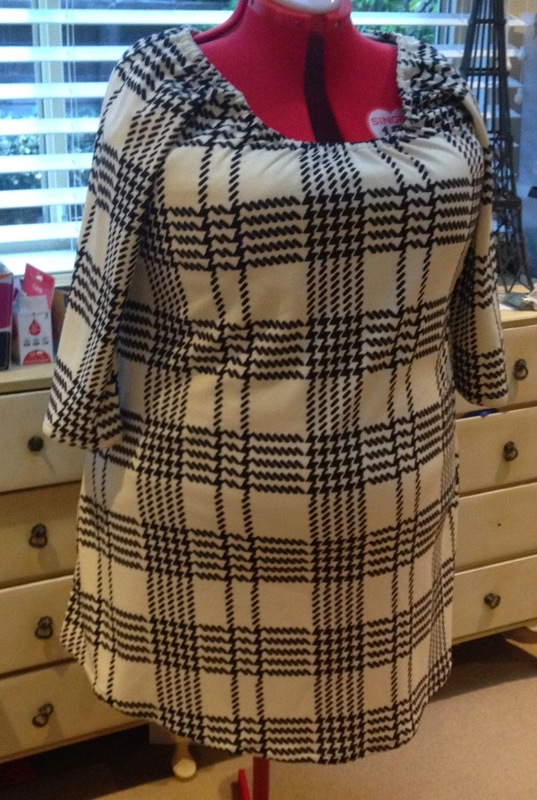 I bought this lovely black and white check, or large houndstooth pattern check last year and I loved it. I couldn't decide what to make so I went with a dress. I wanted easy to comfortable swing style dress, so I pulled out Vogue 8592. I made this dress several years ago and I still wear the dress so I thought I would make it up again. I didn't check measurements because i still wore the other dress. However for this make the arms are really tight and the neck just didn't work. The fabric is a bit odd as well. It was a ponte fabric and it clings to everything. It sticks to itself and was quite disappointing . I sprayed the dress with anti static, but it still clings. I'm not really sure why. I have never had this before. This dress is destined to the charity bin. I was going to cut the top off and make a skirt but I think I will just let it go. 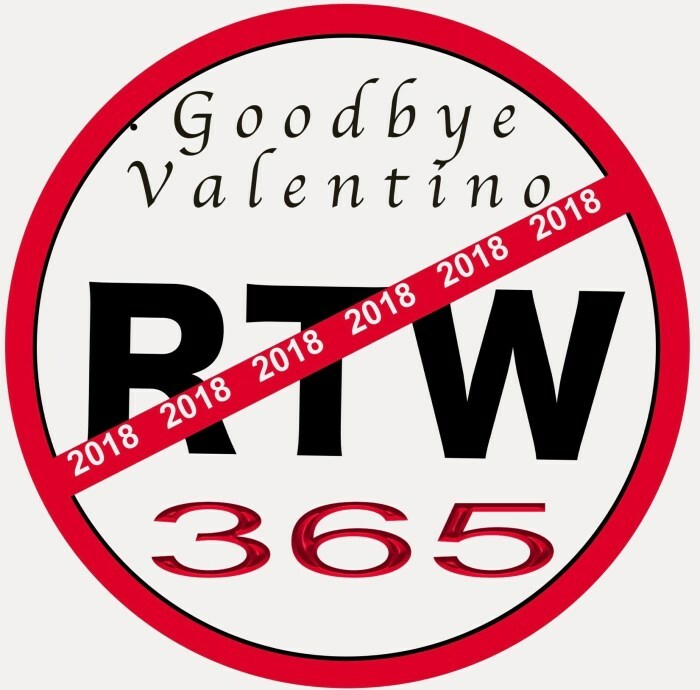 Sometimes its better to depart quickly, rather than hang around for months, only to be eventually thrown out. Back to the drawing board. My how time flies. I actually finished these pants a few weeks ago but hadn't photographed them. 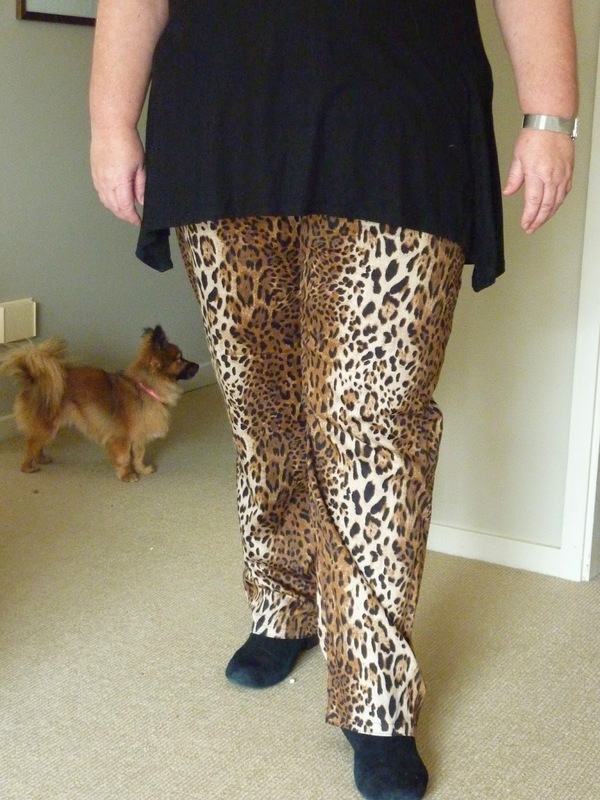 These are style Arc's Barb's stretch pant. I am pretty happy with the fit, although with the photos I'm not so sure now. These went together well. The only adjustments I made was to shorten them by about 4 cm. The fabric was an internet buy from the US, Fabric.com, I think. They are very comfortable. 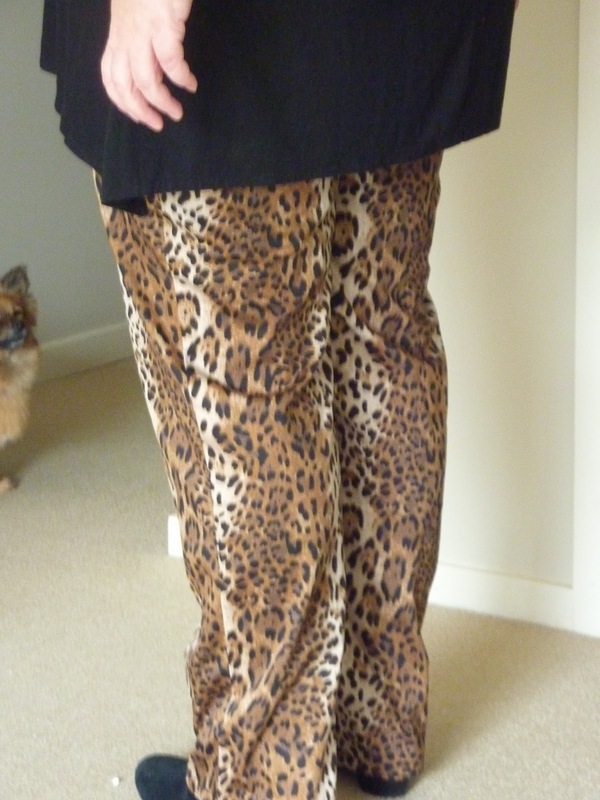 The fabric doesn't have a great deal of stretch so they are possibly a bit more snug around my middle than ideal. 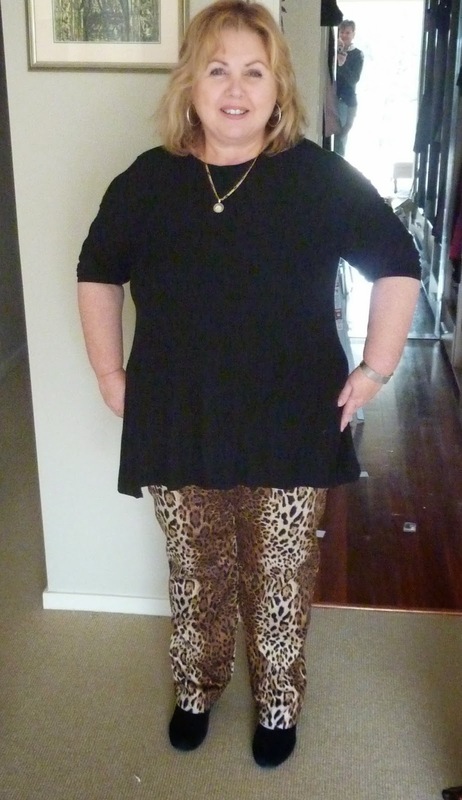 I do like this pattern, not quite as straight as the Elle pant, probably a better work pant. I tried to work out the placement so the dark was down the sides, it wasn't too bad. I'm not sure what the fold around the bottom of my leg is. I have no idea why that is happening. My puppy wanted to be in on the action. Maybe I need to shorten them a bit more. They are a bit of fun though. The fabric is quite thin so they will be good for between seasons. I will definitely be making these again.